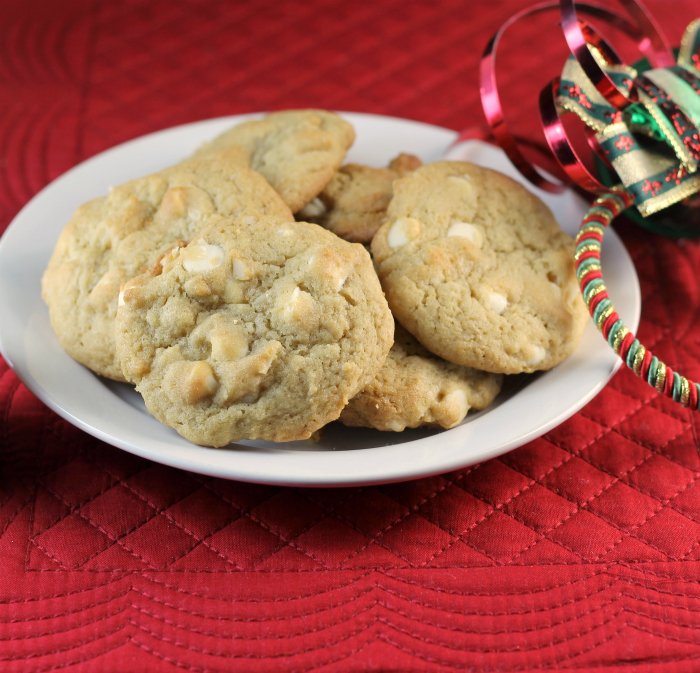 These white chocolate macadamia cookies are my favorite cookie at the Christmas season. What is your favorite? The Christmas cookie season has finally started at our house. It all started out with the popular cutout sugar cookies. This is one cookie that I had altogether stopped making once my kids were grown. It is a cookie that no one showed much interest in anymore, but now that I have a granddaughter that likes to decorate cookies they are back on the list of cookies to make. We spent time frosting and decorating cookies last week with the granddaughter, so much fun. I hope we keep the tradition going because I have a grandson that will probably be interested in these cookies next year. As far back as I can remember cookies have been a part of the Christmas season for me. My mom spent hours baking cookies during the holiday season. I not sure how many different kinds that she made, but I do know that were a lot. I have carried on that tradition, I may not make quite the variety as she did, but still I try to make everybody’s favorite. 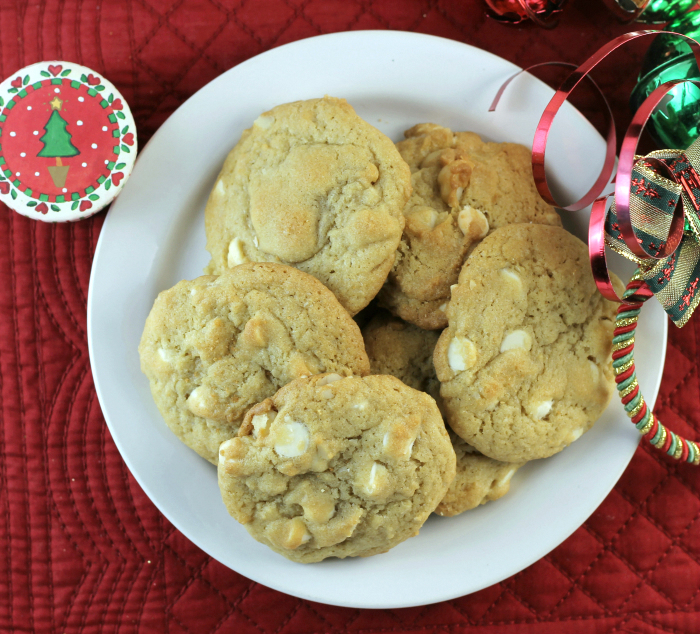 I started baking these white chocolate macadamia cookies several years ago. I have to admit since I started making them they are my favorite cookie of the season. And since the macadamia nuts are quite costly, I make these cookies only at Christmas time. 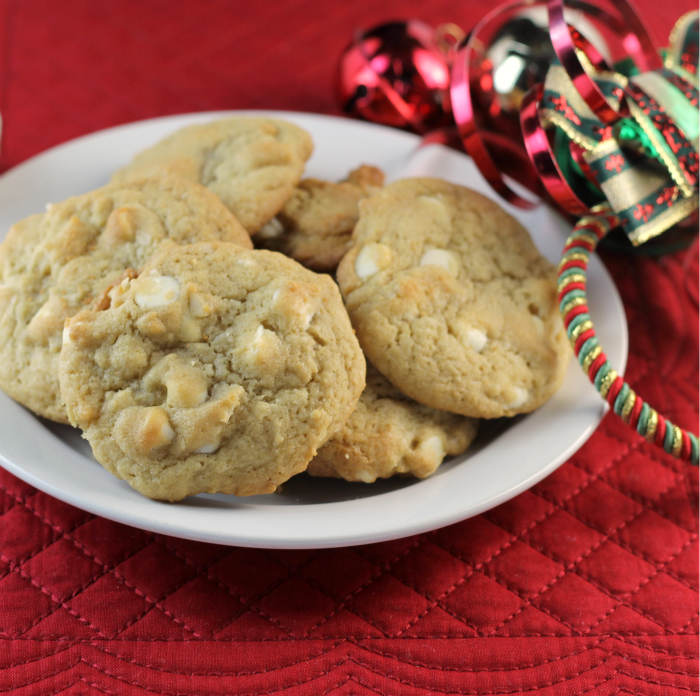 The combination of the white chocolate and the macadamia nuts make these cookies extra special. In a large bowl cream the butter and the sugars together with an electric mixer. Add the eggs and mix until combined. Mix in the vanilla. Sift together the flour, baking soda, and salt, add to the dough and mix in. 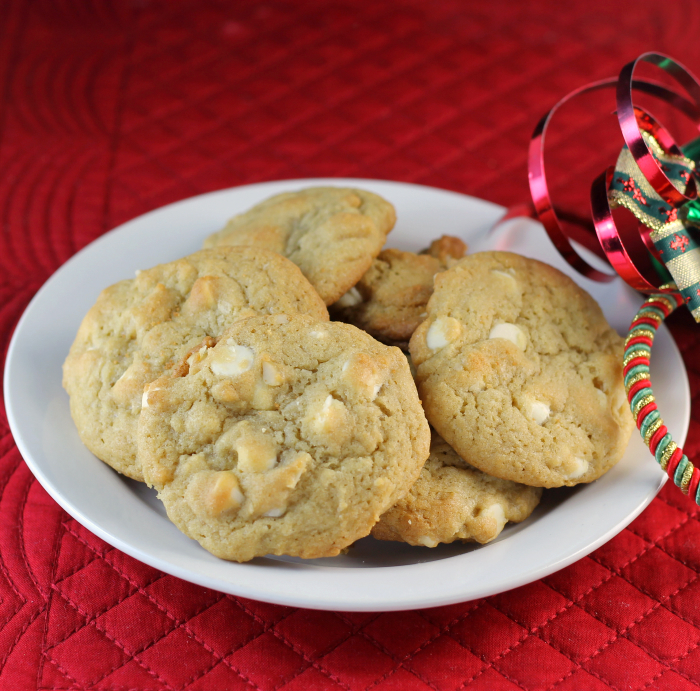 Fold in the macadamia nuts and the white chocolate chips. Drop by rounded teaspoonfuls on the prepared cookie sheets. Place in the preheated oven bake 10 to 12 minutes or until edges are lightly browned. These cookies look delicious Dawn! Fun, fun. Love the red. Hi Dawn, love macadamia nuts in cookies, these look fabulous! These look awesome! We don’t often use macadamia nuts because of the cost (like you). But Christmas, right? Gotta try these — thanks! These cookies look fabulous – I just love macadamia nuts! Lovely Christmas cookie!